I COMMERCIAL OVERVIEW OF THE SHIPPING INDUSTRY. During 2017, Brazilian ports handled a total of 1.086 trillion tons of cargo, surpassing the tonnage handled in 2016 by 8.38 per cent. This increase in cargo handling was recorded in both public ports and private ports, although the ratio of 66.4 per cent of cargo being handled by private ports and 33.6 per cent by public ports remained unchanged. During 2016, there had been a small decrease in cargo handling – 1 per cent – as compared with 2015, reversing a period of steady growth in Brazilian port evolution for several years: 5.62 per cent in 2011; 1.92 per cent in 2012; 2.76 per cent in 2013; 4.25 per cent in 2014; and 4.08 per cent in 2015. The shipping industry in Brazil has always been focused on port support and offshore support rather than cabotage and marine navigation. Thus, the industry suffered greatly from the crisis in the oil and gas sector and the problems with Petrobrás. However, between the end of the second half of 2017 and early 2018, the industry has shown signs of improvement. The growth potential of maritime transport in Brazil is vast, since the country has continental dimensions and has 8,500km of coast and 21,000km of economically navigable waterways. Also, 80 per cent of the Brazilian population lives within 200km of the coast and most of the country’s industry is concentrated near the sea. Cabotage and waterway shipping are the most logical modes of transport, not only because of Brazil’s latent capacity, but also because of the increasing growth in the value of road freight. In recent years, there has been a steady increase in the use of these modes of transport. During 2017, there was a 12 per cent increase in cabotage of containerised cargo, continuing a period of sustained growth: 2.48 per cent in 2016; 7.6 per cent in 2015; 5.54 per cent in 2014; 26.92 per cent in 2013; 27.44 per cent in 2012 and 8.45 per cent in 2011. However, a study carried out by the Brazilian Ministry of Transport indicates that cabotage and waterway shipping represents less than 13 per cent of the Brazilian logistics matrix. However, this is expected to rise to a 29 per cent share by 2025, while road transport will reduce its share of participation to 33 per cent. The Brazilian government has a programme to complete 205 interventions and projects on navigable waterways at a total cost of 15.8 billion reais by 2025. Waterway shipping has already shown significant growth. Since 2015, the government has been encouraging the construction of pushers and dredgers for the domestic transportation of corn and soybeans. In 2016, the Brazilian Merchant Marine Fund (FMM) made available a credit of 3.45 billion reais to build 119 new vessels. Private companies used 68 per cent of this resource to construct pushers and dredgers, totalling 81 new vessels. Logistics is one of the major challenges for grain producers in the State of Mato Grosso, given its distance from the country’s main exportation ports. Therefore, using an alternative route for the flow of production via the North region would appear to be a viable solution. The amount of cargo transported along waterways increased during 2017 by 22 per cent, indicating a speeding up in the logistics process relating to Brazilian commodities. It also demonstrates a move from the dependence on road transport towards waterway shipping for the carriage of Brazilian commodities. 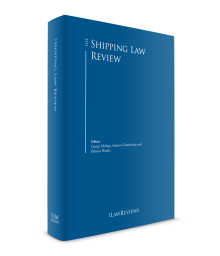 The Brazilian shipping industry is regulated by several scattered laws, creating a very complex regulatory spectrum. The lack of consolidation of maritime legislation results in a difficult harmonisation between laws. They have been published at different times, and under different regimes of government, dating from the time of the Brazil Empire. The Brazilian Commercial Code, which currently regulates maritime trade, maritime contracts, maritime lien, general average and maritime insurance, dates back to 1850, when Brazil was still an empire. The Civil Code of 2002 revoked much of the Commercial Code. However, the chapters regulating maritime transport are still in force. In addition to the Commercial Code, there are several other laws in force (ordinary laws and decrees), as well as international treaties and conventions. The main pieces of legislation on maritime transport are Law No. 9,432, Decree Law 116, the Civil Code of 2002 and Law No. 9,611 of 1998 on Multimodal Transport of Goods. The legal framework for regulation of the shipping and port sector is centred on a federal regulatory body, which has introduced a set of standards that are complemented by the provisions for the Brazilian navy. These regulations relate to safety of navigation, safeguarding human life at sea and prevention of sea pollution, as provided by Law No. 9,537 of 1997, Decree No. 2,596 of 1998 and Law No. 2,180. In this context, the Brazilian Navy Authority, by means of the Ports and Coasts Directory (DPC), issues Maritime Authority Norms (NORMAM). The safety rules established by the Brazilian Navy Authority must be observed by Brazilian vessels and their crew, and anyone else on board, even when in foreign waters (where local regulations must also be observed). Foreign vessels operating under Brazilian jurisdiction waters must also comply with the Brazilian Navy Authority rules. Law No. 2,180 of 1954 regulates the activities and jurisdiction of the Admiralty Court, which is the administrative body responsible for ruling on accidents and navigation incidents in order to identify the party responsible and to apply penalties. The National Waterway Transportation Agency, ANTAQ, created by Law No. 10,233 of 2014, is responsible for regulating and supervising (1) the various modes of maritime navigation, (2) public ports, (3) private terminals and (4) the transportation of special and dangerous cargoes. Nevertheless, ANTAQ regulations must comply with the rules set by the Brazilian Navy Authority regarding, inter alia, the safety of waterway navigation and the safeguarding of human life at sea. One of the main statutes in terms of the regulation of shipping activity is Law No. 9,432 of 1997, which regulates procedures regarding waterway transportation, as provided in Article 178 of the Federal Constitution. It allows the opening of the national market for foreign vessels in both coastal and inland navigations, as well as maritime and port support navigation. However, this is subject to the proviso that a Brazilian shipping company has chartered the vessel, and that the shipping company is incorporated in Brazil and authorised by ANTAQ to operate in the shipping sector. Thus, foreign companies are not allowed to operate in Brazilian coastal and inland navigations. However, ocean navigation is open to foreign shipping companies and foreign vessels, except for restricted cargo as listed under Decree Law 666 and for the export of oil and its by-products. Brazilian legislation gives preference to Brazilian-flagged vessels operating in Brazilian jurisdictional waters. However, as state above, it is possible for a Brazilian shipping company to charter a foreign vessel, but it is necessary to prove the non-existence or unavailability of a suitable Brazilian vessel. In this type of situation, is necessary to request authorisation from ANTAQ through a procedure of circularisation, which means that the market must be consulted regarding the availability of Brazilian-flagged vessels. According to national legislation, a vessel may only fly the Brazilian flag if it is owned or chartered by a Brazilian shipping company. In the case of the bareboat charter of a vessel, it is necessary to request suspension of the original flag registration and register the vessel with the Brazilian Special Registry (REB). It is also necessary to prove that the Brazilian shipping company has tonnage under construction in a Brazilian shipyard or already has a Brazilian-registered vessel. If these requirements are fulfilled, it is not necessary for the national market to be consulted. The Brazilian Labour Ministry has also outlined regulations regarding the operation of foreign vessels in Brazil. Normative Instruction 72 demands that a certain proportion of the crew must be Brazilian citizens. The proportion will depend on the length of time the foreign vessel remains in Brazil and its activity. In relation to maritime labour, Brazil has not ratified the Maritime Labour Convention: the current legal framework applicable in Brazil is NORMAM 13/DPC of 2013, NR nos. 30, 72 and ILO Convention No. 147. Among the global conventions ratified by Brazil are the Collision Conventions, the 1924 International Convention for the Unification of Certain Rules relating to the Limitation of Liability of Owners of Seagoing Vessels (Brussels), the International Convention for the Unification of Certain Rules of Law relating to Maritime Liens and Mortgages, MARPOL and the 1989 Salvage Convention. The Brazilian Code of Civil Procedure lays down the jurisdiction of the state courts to resolve disputes between private entities. The Brazilian federal courts only judge cases related to maritime law when it involves a federal entity or a ship of the Brazilian navy. when the parties, expressly or implicitly, submit to Brazilian jurisdiction. The Brazilian judicial system is organised on different levels. At the first instance, a single judge decides the claims. Subsequently, the courts of appeal act as a second instance, when a group of judges will rule on the appeal. Judgments rendered by the courts of second instance may be subject to subsequent appeal to the Superior Court of Justice (STJ) or the Federal Supreme Court. In addition to the judicial system, any navigational events or accidents are subject to administrative proceedings, since it is mandatory for the local navy authority to carry out an inquiry to determine the causes of the incident. The inquiry is then forwarded to the Admiralty Court for review and judgment. The Admiralty Court is an administrative, not a judicial, court and subordinated to the Ministry of Defence. It has jurisdiction to issue penalties to crew members or shipping companies that are found liable. The Admiralty Court has no jurisdiction regarding liability and damages awards between private entities. Brazil is fifth highest in terms of the number of parties involved in arbitration, according to the 2016 global rankings by the International Chamber of Commerce. In fact, Brazil could be placed even higher, since the countries placed second and third in the ICC ranking (namely US Virgin Islands and Belize) are ranked by virtue of their geographical position and not their local situation, since the majority of arbitration in those countries relates to foreign entities, not domestic ones. the possibility of submitting the other party to arbitration through enforcement. Several changes were made to the Brazilian ADR system in 2015. The Arbitration Law has undergone several changes with the advent of Law No. 13,105 of 2015, allowing the use of an arbitration clause in contracts signed by public authorities and port authorities, and regarding regulated matters relating to emergency measures, among others. Law No. 13,140 of 2015 regulates mediation between private entities, setting forth that the award must be approved by the judiciary. Law No. 13,105 of 2015 (Code of Civil Procedure) instituted the stimulation of ADR (conciliation and mediation) methods to resolve conflict, in order to reduce the number of claims going through the courts. Thus, the general rule is that before presenting a case, the parties must be summoned to a mediation hearing, where they will be informed of the risks of proceeding through the judicial system. At the hearing, qualified professionals or a magistrate will aim to guide the parties towards an amicable settlement of the claim. Before a decision rendered by the judiciary of another country can be enforced in Brazil, a process of recognition or ratification of the judgment through the STJ is required. it is accompanied by an official translation, unless otherwise formally agreed. In addition, in order to be approved, the foreign decision must be a final judgment from the country of origin. The Superior Court of Justice will not approve a foreign judgment award arbitration that is contrary to public policy, national sovereignty or the dignity of the human person. The Superior Court of Justice will not verify the merits of a case to grant the exequatur. Therefore, when all the requirements are present, the arbitral award or judgment will be approved, then sent to the federal court that holds jurisdiction over the domicile of the debtor in order to proceed with the restriction of assets. Under the terms of Law No. 2,180 of 1954 and Law No. 7,652 of 1988, a shipbuilding contract must be registered with the Maritime Registry and before the Admiralty Court, to allow the transfer of ownership of the vessel from the shipyard to the acquiring company. The transfer of ownership through the Admiralty Court is essential for the process to be effective as regards to third parties. Registration must be completed within 15 days of the transfer of ownership, which may be the date of delivery of the vessel by the shipyard or other means of transfer of the property. All operations in a shipyard, including the supply of parts, are considered as export operations and therefore benefit from the same tax exemptions. Brazil has a protectionist legislation with regard to maritime transport contracts. Thus, the country is not a signatory to the Hague, Hague-Visby, Hamburg or Rotterdam rules. The bill of lading has been recognised as a contract of adhesion by the Brazilian courts. Thus, clauses that have not been freely agreed between parties are invalid. In situations such as these, the judiciary has the power to annul a jurisdiction clause and other clauses that limit or exclude carrier liability. Under Brazilian law, the carrier has an obligation of result, which starts when the cargo is loaded and only ceases with delivery – in the same condition as it was received – to the holder of the original bill of lading. In the event of a cargo claim, the carrier may be held liable even without any clear fault. Thus, according to legal doctrine and jurisprudence, the carrier has strict liability. The burden of proof is therefore on the carrier, who will succeed in refuting liability only when it can prove (1) the exclusive fault of the victim, (2) the exclusive fault of a third party, (3) a chance event, (4) force majeure or (5) an inherent fault in the goods or in the packing thereof. In addition to the comments above, in subsection ii, pursuant to the law, in the event of any loss or damage during carriage, both the cargo owner and the insurer will have title to file a claim against the carrier. However, the insurer will have to be subrogated to the rights of the cargo owner. Pursuant to Decree Law 116 of 1967, the time bar for cargo claims before the Supreme Federal Court is one year. Similarly, the deadline for multimodal transportation is one year, according to Law No. 9,611. However, as established in the Civil Code, the consignee only retains the right of action against the carrier if a protest has been lodged within 10 days of delivery, clearly stating the damage that has occurred. Brazil has a protectionist legislation with regard to the carriage of goods by sea. Thus, the country is not a signatory to the Hague, Hague-Visby, Hamburg or Rotterdam rules. Likewise, Brazil has not yet ratified the LLCM Convention 1976. However, Brazil has ratified the Brussels Convention of 1924, despite the jurisprudence not accepting its application. The jurisprudence is not without its problems on the subject of limitation of liability of the maritime carrier. Generally, in cases of extra-judicial liability, the rules of full liability are applied. However, in cases of contractual liability, there are several judgments applying the provisions of the Brazilian Civil Code that liability is limited to the value of the load. Otherwise, as already discussed, the limitation of liability is generally considered invalid in contracts of adhesion, when such clauses are not freely negotiated by the parties. Nevertheless, there have been some judgments in which it has been considered possible to limit liability, when there is no great discrepancy between the value of the damage and the indemnity limit. However, the parties must have equal status (economically and technically), and the clauses must have been freely negotiated between the parties, not in the form of a contract of adhesion. Arrest is a cautionary measure to enable a future action to be brought. Thus, in order for a magistrate to investigate an arrest request, it is necessary for the Brazilian courts to have jurisdiction to try the main action. Brazilian jurisdiction will apply on the hypotheses described in Section III. To date, Brazil has not ratified any of the Arrest Conventions, which makes it difficult to file an arrest warrant to secure a main suit filed in another jurisdiction. However, there are some judicial decisions that are in compliance with this practice, especially with regard to preliminary measures prior to arbitration proceedings in another jurisdiction. The legislation currently regulating ship arrest and maritime liens is the Commercial Code, the Brussels Convention for the Unification of the Maritime Privileged Credit Rules and the Civil Procedure Code. periculum in mora, that without the arrest, the claimant may be at risk of suffering serious and irreparable damage or it will be difficult to enforce if a guarantee is not obtained through the arrest. The Brazilian Civil Procedure Code states that the court may impose, at its discretion, a counter-security. Furthermore, if a claim is lodged by a foreign plaintiff, the court may request a security for the court costs and legal fees incurred by the defendant lawyer, corresponding to between 10 and 20 per cent of the total amount claimed. A letter of credit issued by a first-line bank headquartered in Brazil may be offered instead of a monetary deposit. Brazil has only ratified and signed the International Brussels Convention of 1926. However, the Brazilian Commercial Code sets forth in Articles 470 and 471 some privileged credits, which are binding as maritime liens, following the vessel, notwithstanding any change of ownership or flag. state or private port operators’ credits. According to civil procedure rules, the court can authorise the sale of a vessel at public auction when there is a pendente lite and the shipowner does not present a guarantee and is not conserving the asset, namely the vessel. This is in the interests of the plaintiff and to protect the environment from any risk of oil pollution or other hazard should the vessel become damaged or start to break up. The judicial sale of a vessel follows the same general rules as asset bidding. Once the sale is duly performed, the judge will release an order of sale and the buyer will be able to register the vessel with the Admiralty Court, free from any impediment or debt. The Brazilian Commercial Code provides that the legal sale of the vessel cancels any existing maritime credit or lien existing up to the date of the auction. The Brazilian Navy Authority issues regulations regarding the safety of navigation, the safeguarding of human life at sea and the prevention of water pollution. In this regard, the rules are established by Law No. 9,537 of 1997, Decree No. 2,596 of 1998 and NORMAM-07/DPC. Brazil has also ratified several international conventions regarding safety, as discussed in subsections iv and v.
Foreign-flagged vessels are subject to port state control in accordance with the international conventions ratified by Brazil and with the Maritime Authority Regulations for the Operation of Foreign-Flagged Vessels in Brazilian Jurisdictional Waters (NORMAM-04/DPC). Port state control is performed by qualified and accredited marine inspectors, according to NORMAM-04/DPC. Brazil is also a member of the Viña del Mar MOU. Vessels above 100 TEUs should be registered with the Admiralty Court and those of lower tonnage with the Navy Authority. Law No. 7,652 of 1988 regulates the registration of maritime property. The Admiralty Court is also responsible for registering encumbrances and mortgages on vessels, and the Brazilian Special Regime deals with second registrations of vessels, by suspending the registration flag and providing benefits to shipowners (as discussed in Section IV.i). Under NORMAM-06/DPC, the Ports and Coasts Directorate of Brazil accredits classification companies to act on behalf of the Brazilian government in the regulation, control and certification of vessels. In addition to the duly appointed representatives of the Navy Authority, only the specialised entities formally recognised through a recognition agreement may perform, on behalf of the Maritime Authority, audits, inspections, surveys and issuances of certificates and other documents provided for in international conventions and codes of which the country is a signatory or in the applicable national law, except in special situations. The authority to act on behalf of the Navy Authority relates to carrying out tests, measurements, calculations, surveys, inspections, audits in shipping companies, vessels and maritime structures, including their associated systems, equipment and facilities, and the issuance, renewal or endorsement of certificates, reports, licences or any other relevant document provided for in international conventions and codes and other applicable national legislation. As a general rule, classification companies have no liability on the vessels they have certified. Similarly, there is no form of regulation on liability to third parties. However, obviously, in a proven case of negligence or impropriety, it is possible that the judiciary will hold them accountable for liability. The Brazilian legal framework incorporates several international marine pollution conventions, such as MARPOL, the CLC Convention and the OPRC Convention. There is also extensive domestic legislation covering environmental matters, and supervisory bodies in all the federative jurisdictions. Thus, the environmental framework is quite complex, mainly due to the fact that it is not rarely verified the overlap of competence between environmental agencies. Law No. 9,966/2000 (the Oil Law). Brazil has ratified several international conventions, including the International Convention on Regulation for Preventing Collisions at Sea 1983, the COLREGs, the FAL Convention, UNCLOS, the Search and Rescue Convention 1979, MARPOL, the 1989 Salvage Convention and the Agreement to implement UNCLOS. All vessels in Brazilian jurisdictional waters are obliged to provide assistance and rescue to vessels in dangerous situations. The applicable regulations are Law No. 7,542, Decree No. 8,814 and NORMAM-10/DPC. If no provision is made otherwise between the parties, no compensation is due if the salvage operations have not obtained a beneficial result. However, if the rescuer has carried out a salvage operation and prevented environmental damage but has not received a reward, the rescuer shall be entitled to special compensation to be paid by the shipowner, to an amount equivalent to the salvor’s expenses. The Navy Authority is responsible for authorising the removal of wrecks. However, it may have interventions and follow-up through environmental agencies. The applicable regulations are the Civil Code, the Consumer Code and Law No. 11,771 (in cases of cruise ships). The rights of passengers are considered as a consumer relationship and are therefore quite protectionist, and must comply with consumer legislation. The carrier is obligated to ensure the safety and well-being of passengers during the entire journey. Brazil has not yet ratified the Maritime Labour Convention. However, it has ratified several ILO conventions, among them Nos. 22, 92, 108, 134, 146, 147, 152, 163, 164, 166 and 185. The Brazilian judiciary has understood that it is competent to adjudicate demands for labour cases regarding foreign crew members when a vessel is abandoned in Brazilian jurisdictional waters, or when the vessel was operating in Brazilian jurisdiction waters. At the end of 2017, ANTAQ published Normative Resolution 18/2017, which deals with the rights and duties of users, intermediary agents and companies operating in offshore support, port support, cabotage and ocean transport. The Resolution also establishes administrative infractions to the actors involved in the shipping industry. These new rules will serve to balance conflicting interests and sanction the practices of certain service providers. The Resolution establishes a true regulatory framework for the industry. Another point to highlight is that a Bill for the New Commercial Code that will update Brazilian maritime legislation is currently going through due process at the National Congress. Much of the legislation currently in use dates back to the 1850 Commercial Code. The Bill provides for changes relating to maritime transport contracts, limitation of liability, charter agreements and other matters pertaining to shipping. This legislative amendment will be fundamental in updating the existing framework, and will incorporate several proceedings and rules established by conventions that are not yet ratified. The Bill has been in process since 2011, and it is necessary to wait for the entire legal process to be completed so that, if approved, it may become law. Finally, the Code of Civil Procedure, as amended in 2016, now provides for the implementation of several simplifications to judicial processes, with the aim of reducing the number of claims going through the judicial system through the use of ADR methods. 1 Larry John Rabb Carvalho is a senior partner at Promare. 2 The PIS (Program of Social Integration) and COFINS (Contribution for the Financing of Social Security) are federal taxes based on the turnover of companies.